If your goal is a colorful sunset/sunrise and you have to choose between pristine or hazy air, which would you choose? If you said clean air, you’re in the minority. You’re also right. Despite some pretty obvious evidence to the contrary, it seems that the myth that a colorful sunset requires lots of particles in the air persists. If particles in the air were necessary for sunset color, Los Angeles would be known for its vivid sunsets and Hawaii would only be known for its beaches. But what is the secret to a great sunset? Granted, a cool breeze, warm surf, and a Mai Tai are a good start, but I’m thinking more photographically than recreationally. I look for a mix of clouds (to catch the color) with an opening for the sun to pass through. But even with a nice mix of clouds and sky, sometimes the color fizzles. Often the missing ingredient, contrary to common belief, is clean air—the cleaner the better. Because a beam of sunlight passing in a vacuum (such as space) moves in a straight line, all its wavelengths reach our eyes simultaneously and we perceive the light as white. When a beam of sunlight encounters something, its light can be absorbed, reflected, or scattered, depending on the wavelength and the properties of the interfering medium, and we see as color the remaining wavelength that reach our eyes. For example, when sunlight strikes a leaf, all of its wavelengths except those that we perceive as green are absorbed. Since our atmosphere is not a vacuum, sunlight is changed simply by passing through it. In an atmosphere without impurities (such as smoke and dust), light interacts only with air molecules. Air molecules are so small that they scatter (reflect) only a very narrow range of wavelengths. This atmospheric scattering acts like a filter that scatters the violet and blue wavelengths first, allowing the longer wavelengths to pass through. When our sunlight has traveled through a relatively small amount of atmosphere (as it does when the sun is overhead), the wavelengths that reach our eyes are the just-scattered violet and blue wavelengths, and our sky looks blue (the sky appears more blue than violet because our eyes are more sensitive to blue light). Pollution dampens the filtering process. Rather than only reflecting specific colors, light that encounters a molecule larger than its wavelength is more completely reflected—in other words, instead of reflecting only the blue and violet wavelengths, polluted air catches some orange and reds too. Anyone who has blended a smoothie consisting of a variety of brightly colored ingredients (such as strawberries, blueberries, and cantaloupe—yum) knows the smoothie’s color won’t be nearly as vivid as any of its ingredients, not even close. Instead you’ll end up with a brownish or grayish muck that might at best be slightly tinted with the color of the predominant ingredient. Midday light that interacts with large particles in the atmosphere is similarly muddied, while polluted sunrise and sunset light has already had much of its red stripped out. Verify this for yourself the next time a storm clears as the sun sets, and compare the color you see to the color on a hot, summer evening in the city. Any time there’s been rain to clean the atmosphere, and the remaining clouds are mixed with sunlight, there’s a good chance for sunrise or sunset color. I have a few go-to locations near home, and at my frequently visited photo locations (Yosemite, Grand Canyon, Hawaii, and so on) that I beeline to when there’s a chance for color in the sky. When I’m on location and preparing my shot before the sunset show begins, I look for clouds getting direct sunlight. This is the light that will get color at sunset, starting with an amber glow that transitions to pink, red, and eventually a deep orange. An often overlooked color opportunity when the air is clean is the horizon opposite the sun after sunset or before sunrise. When the sun is below the horizon, the transition between the blues of night and the pinks of the sun’s first or last rays the best color of the day. This is especially true when there are no clouds in the direction of the sun. Photographing color with your back to the sun has the added advantage of being much less contrasty and easier to manage with a camera. 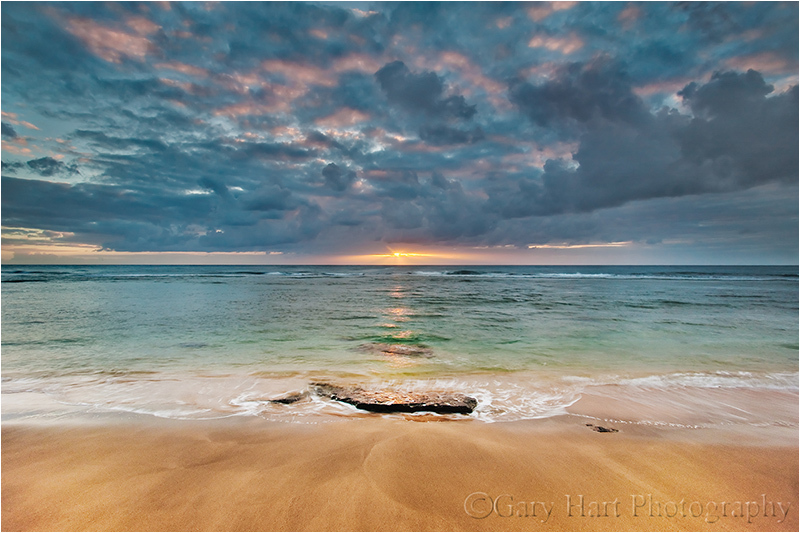 Maximizing sunset color in your images requires careful exposure and composition decisions. By far the most frequent problem is overexposure—giving the scene more light than necessary. In scenes of such extreme contrast, your camera can’t capture the entire range of light your eyes see. And of course your camera has no idea what you’re photographing, so if you leave the exposure decision up to automatic metering, you’ll likely end up with a compromise exposure that tries to pull detail out of the shadows at the expense of color in the sky. Since it’s the color you’re most interested in capturing, it’s usually best to go ahead and a allow your shadows to go black to spare the color in the highlights. This usually requires some planning—finding striking subjects that stand out against the brighter sky or water. When you’ve found your sunset subject, turn off automatic exposure and meter on the sky, setting the exposure to no more than 2-stops above a middle tone (and usually darker). Remember, since your camera can’t capture what your eyes see anyway, the amount of light you give your scene is a creative decision. After you’ve exposed, make sure you check your RGB histogram to ensure that you haven’t clipped one of your color channels. You can read more about metering in my Manual Exposure article. Sentinel Dome in Yosemite provides a 360 degree view of Yosemite and surrounding Sierra peaks. 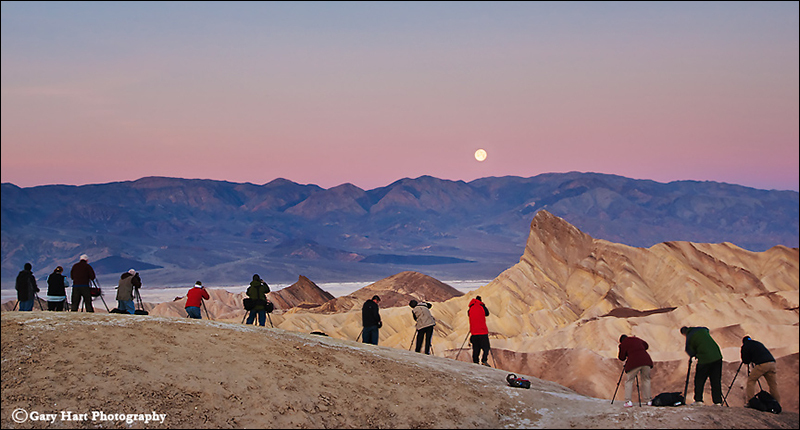 Among the many reasons it’s such a great sunset spot is that from atop Sentinel Dome you can see what’s happening on the western horizon and plan your shoot long before sunset arrives. On this summer evening I was up there shortly after an afternoon rain shower. The air was crystal clear, but lots of clouds remained, but there was an opening on the western horizon for the sun to slip through just before disappearing for the night. Rather than settle for a more standard Half Dome composition, I wandered around a bit in search of an interesting foreground. I ended up targeting this group of dead pines on Sentinel’s northeast slope, a couple of hundred feet down from the summit. It was no coincidence that sunset that night, one of the most vivid I’ve ever seen, came shortly after an afternoon rain had cleansed the atmosphere. Not only did the clouds fire up, the color was so intense that its reflection colored the granite, trees, and pretty much every other exposed surface. 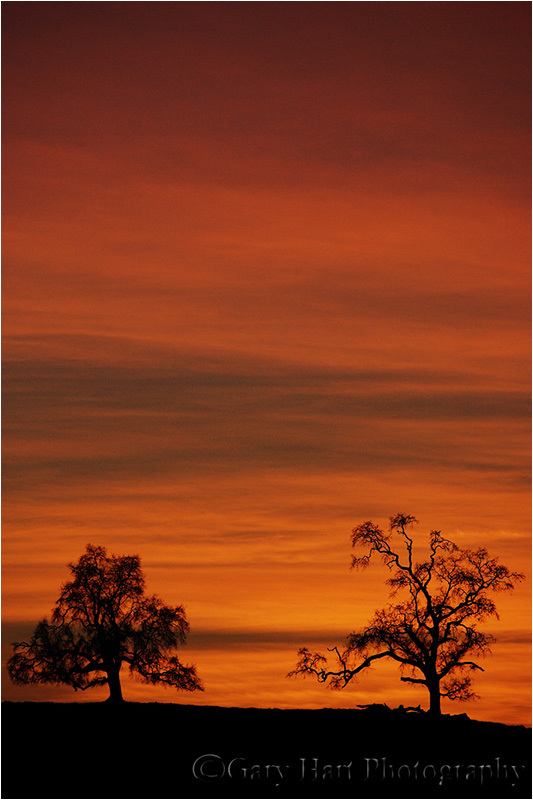 I was driving the Sierra foothills east of Sacramento looking for the right subject to put with this fiery sunset. Earlier in the sunset it had simply been a been a matter of finding a photogenic tree (or trees), but with the sun more than 15 minutes below the horizon, the foreground was so dark I needed a subject to silhouette against the sky—anything else would have been lost in the rapidly blackening shadows. These trees showed up just in the nick of time. Color like this comes late (or early at sunrise), in the direction of the sun long after most people have gone to dinner. Everything in this scene that’s not sky is black, which is why my subject needed to stand out against the sky. I was so happy with my discovery that these trees have become go-to subjects for me—browse my galleries and count how many times you see one or both of them. The air on Sierra’s east side is much cleaner than air on the more populated west side, and the clouds formed as the prevailing westerly wind descends the Sierra’s precipitous east side are both unique and dramatic. Mono Lake makes a particularly nice subject for the Eastern Sierra’s brilliant sunrise/sunset shows. Not only does it benefit from the clean air and photogenic clouds, Mono Lake’s tufa formations and (frequently) reflective surface make a wonderful foreground. The openness of the terrain surrounding Mono Lake allows you to watch the entire sunrise or sunset unfold. Many times over the course of a sunrise or sunset I’ve photographed in every direction. The image here was captured at the start of a particularly vivid sunrise. The air was clean, with just the right mix of clouds and clear sky; perfectly calm air allowed the lake’s surface to smooth to glass. I find that the more I can anticipate skies like this, the better prepared I am when something spectacular happens. In this case I was at the lake well before the color started, but because it looked like all the sunrise stars were aligning, I was able to plan my composition and settings well before the color started. GARY, YOUR “LIGHT” CLASS TODAY WAS GREAT, THANK YOU. I AM A HOBBYIST LANDSCAPE PHOTOGRAPHER AND YOUR LESSON ON LIGHT WILL BE VERY HELPFUL. I HAVE ADMIRED YOUR WORK FOR SEVERAL YEARS. Yet another great article from you, hopefully my old brain is absorbing at least some of what you say. Great photos as always. Thanks for writing these blogs Gary. Very interesting. You’re very welcome, Adam. Thanks for visiting.